Against the Tide is a 24"x36" acrylic on wood frame panel. (Select "Wall Preview" below for a room type, size and wall color to better view the art). Against the Tide is based on the Jekyll Island "bone yard". It is a wet into wet representational artwork on wood frame panel. It's hard to be at Talbot Island State Park Florida and not be fascinated by the sculptural twists and turns of the driftwood decorating the beach there, as if it were a monument to nature. I was particularly enjoying the way the water rushes in at a certain time of the day when the tides are up after a full moon. I go early when the light is warm, say 6am and scout the beach for combinations of active surf juxtaposed against the stern shapes of the wood, craggy and standing like sentinals against the tide. (Select "Wall Preview" below for a room type, size and wall color to better view the art). 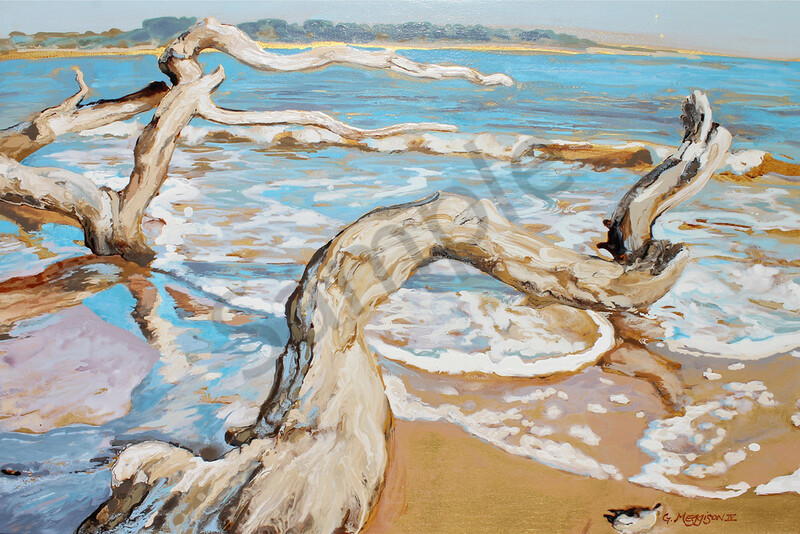 Against the Tide is a 24"X 36"acrylic original on wood panel on wood frame panel. (Select "Wall Preview" below for a room type, size and wall color to better view the art). Against the Tide is a wet into wet representational artwork on wood frame panel. It's hard to be at Talbot Island State Park Florida and not be fascinated by the sculptural twists and turns of the driftwood decorating the beach there, as if it were a monument to nature. I was particularly enjoying the way the water rushes in at a certain time of the day when the tides are up after a full moon. I go early when the light is warm, say 6am and scout the beach for combinations of active surf juxtaposed against the stern shapes of the wood, craggy and standing like sentinals against the tide. (Select "Wall Preview" below for a room type, size and wall color to better view the art).